On Fyre at Synchro Capers! 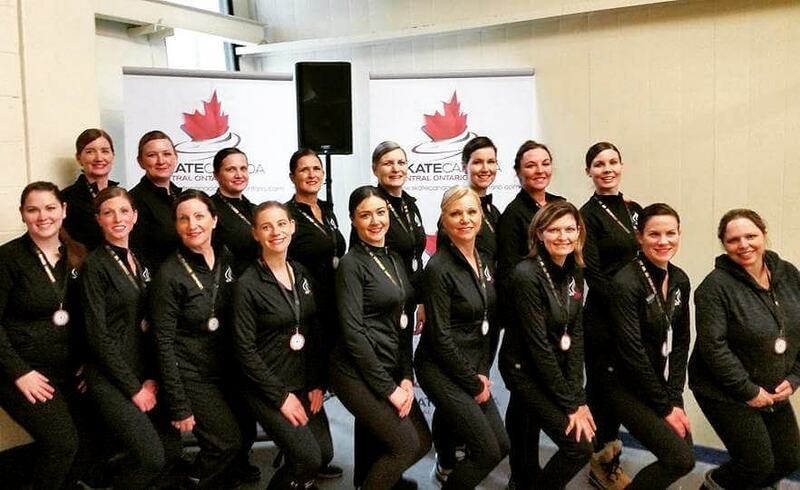 Ice Fyre's Beginner II, Elementary, Pre Novice, Adult I, and Adult III teams competed in Synchro Capers in Oakville from January 27-28 and came home with lots of hardware! Congratulations to all teams on fantastic skates. Many of the teams scored their highest scores/best report cards of the season, and all teams had clean skates. We are extremely proud of all skaters, coaches, and their families for the dedication, determination, and commitment that led to the clubs success over the weekend. Up next... Regionals for Pre Novice, Adult I, and Adult III! Congratulations to our Pre Novice, Adult I, and Adult III teams on their success at Winterfest in Mississauga this weekend (January 5-7). The Pre Novice team achieved their highest score to date, had two clean skates, and moved from 7th to 4th in their second skate - what a comeback! Our Adult I team competed for the first time this season, debuting their 'Circle of Life' program - music from the Lion King, and a tribute to Veronica. The team captured silver in the silver final. Our Adult III team also competed for the first time this season debuting their Gatsby themed program and finishing fourth in the gold final. Congratulations to all teams on their success and we look forward to seeing you compete at Capers on January 27-28. Our Annual Ice Show is Just Around the Corner!!! Merchandise will be available at the rink on Sunday, October 1 and Sunday, October 15 during practices. If any adult skaters are interested in purchasing merchandise, please reach out to the board if you are not able to come to the rink on a Sunday. We will do our best to make it out to one of your practices. This Sunday, merchandise will be available in the lobby following the parent meeting. Please note, we will accept cheques as payment or the amount can be put on your skater invoice. Ice Fyre will once again be participating in the Run for the Cure taking place Sunday, October 1 at Lakeview Park in Oshawa. The run holds a special place in our hearts as our club lost a skater, and our hero, to cancer at the end of last season. Veronica MacIntosh was the strongest and most courageous skater we know, and together we will run in her honour and memory in hopes of finding a cure. 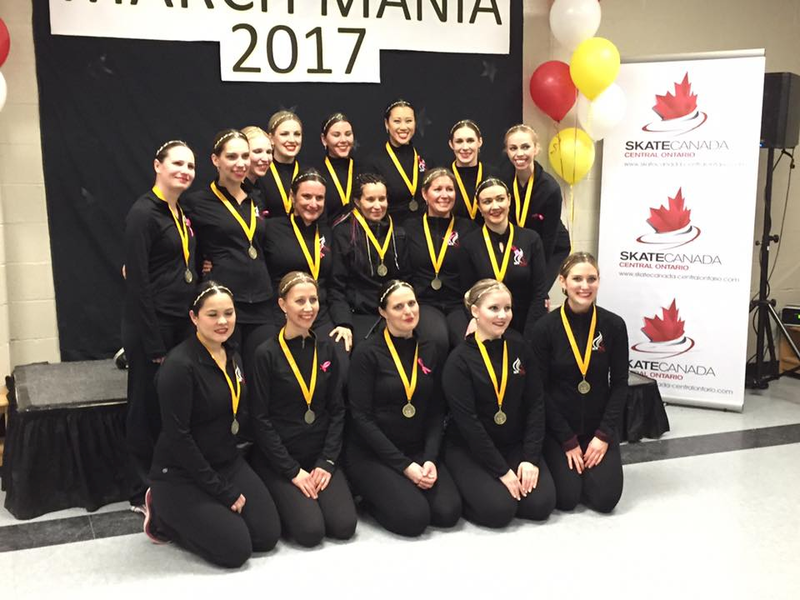 Skate Ontario Announces Synchro Competitions for 2017/2018 Season! The following competitions are taking place in Ontario during the 2017/2018 synchronized skating season. Please note that this is a list of ALL competitions, and we will inform each team as to which ones they will be competing in. Veronica MacIntosh, a member of our Adult I team, passed away on March 15th after a long and hard fought battle with cancer. She was a skater with our Adult I team for the past two years, and formerly competed with Ice X Perience in British Columbia. Her passion for skating, zest for life, and beautiful smile, impacted our club in a way one could never imagine. Veronica was an inspiration to everyone she met, refusing to let cancer take over life, and living every moment to the absolute fullest. In her last days she was at the rink watching the Junior World Synchronized Skating Championship, in its entirety, because she didn’t want to miss a single team. Our club was truly blessed to have met such a beautiful soul, skater, and inspiration, and we will always feel her presence at the rink. The entire MacIntosh family is a part of our club – Veronica’s daughter Paige is a skater on our Pre Novice team, her husband Adam plays music for our Adult I team and is their biggest supporter (bringing Veronica to every practice to be with the team), and her son Conall was always happy to help with music and arrangements to make sure Veronica and Adam could be at Adult I practices. Veronica, you are always in our hearts, and with our teams. Congratulations to All Teams on a Fantastic Year-End at March Mania! Congratulations to Adult I & III teams on their gold medal performances at March Mania! Our Pre Novice team achieved their best score of the seasons, and moved from 4th to 2nd place in their second skate. Beginner II and Elementary ended the season with amazing performances and clean skates. Congratulations to all of our skaters, their families, and our fans - 2016/2017 was an awesome season! Adult III Wins Bronze at Regionals! Congratulations to our Adult III team on their bronze medal finish at Regionals! The team made a massive comeback - after finishing 6th in their first skate, they gave it their all in their second skate, and moved up three spots to finish in 3rd (out of 13 teams). It was their best performance of the season, and we extremely proud of their accomplishment! Congratulations to our Adult I, Pre Novice, and Elementary teams on their fantastic performances as well! Adult I finished 7/12, Pre Novice finished 8/14, and Elementary 11/17. We are heading back to the rink with determination as we head in to our final competition of the season, March Mania. 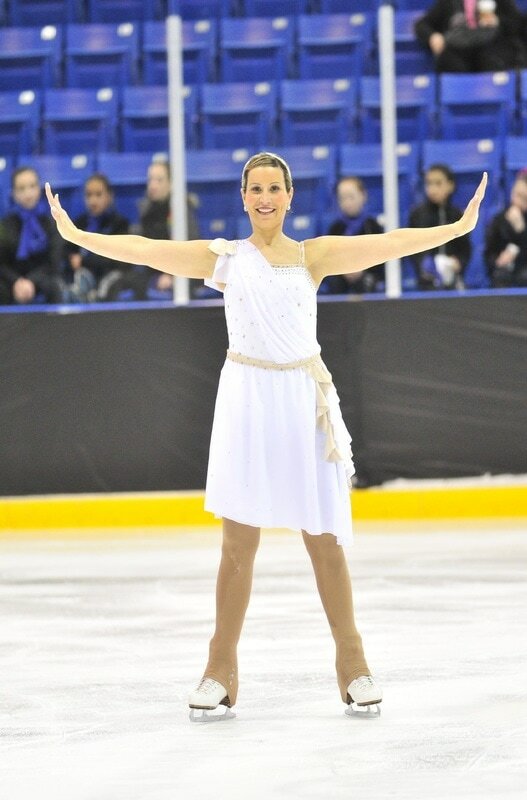 The Ice Fyre family is extremely fortunate to have been touched by such a strong and inspirational skater, Veronica. She has been a member of our Adult I team for the past two years after moving back to ON from BC. 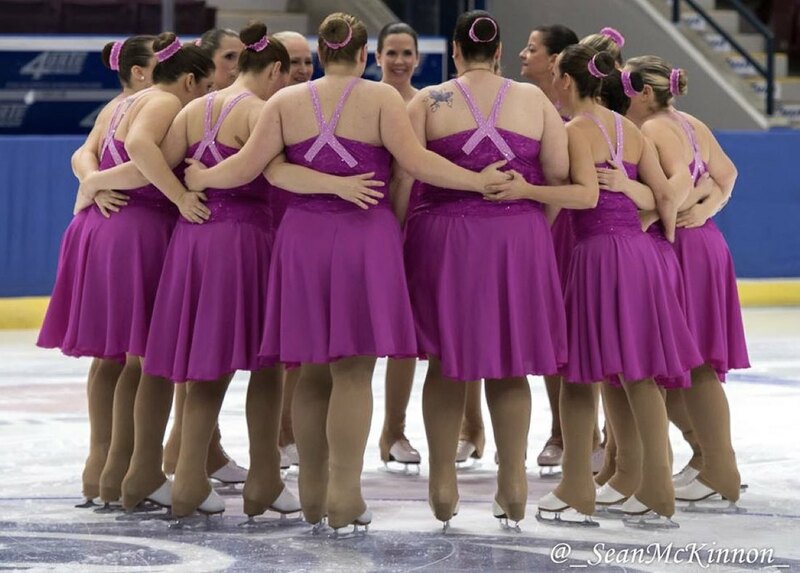 This season, Ice X Perience, the team she skated for in BC, skates to a touching program that they have dedicated to Veronica and her battle with breast cancer. Please click on the photo to read this article. Veronica, you are an inspiration to everyone around you, the synchro world, and everyone that is fighting to live everyday to the fullest. Pre Novice Wins Bronze at Bill Phillips! December 10, 2016 - Ice Fyre Pre Novice started their competitive season in Stratford, ON at the Bill Phillips Memorial Competition. The team had two fantastic skates/performances, and finished 3rd out of 11 teams! Their placement is a reflection of their work ethic, commitment, and teamwork. Congratulations to the team on their fantastic skates! The medals are a great keepsake, but the memories are what will last forever. The team competes again at Winterfest in Mississauga, ON from January 13-14 along with Ice Fyre's Adult I & III teams. Elementary and Beginner II begin their competition season at the end of January in Oakville. Ice Fyre Family Skate - December 17 from 5:00-6:30 p.m.
​The board is happy to host the Ice Fyre Family Skate on Saturday December 17th from 5:00-6:30 at McKinney Arena. We will have a hospitality room set up in the upstairs dryland training room with treats and warm drinks. Please join us for this fun family event and some holiday cheer. In lieu of charging for this event, we ask that you bring a non perishable food donation that we will then pass on to a local food drive. Order forms are now available for our last personal fundraiser of the season. There will be hard copies available at the rink. There is also an online ordering component to this fundraiser. You can send your family and friends the link http://www.pizzakit.ca/fundraising-products?shop=1&f=323286&s=213373 and they can then purchase online. Please note our fundraising i.d. number is 323286. Their orders will be delivered with all the others on Thursday January 26th. Final orders (online and hard copy) need to be in by Sunday January 8, 2017 with a delivery date of Thursday January 26, 2017 at McKinney Arena. Pizza kits MUST be picked up between 6:00-9:00 on January 26th as we do not have storage for items not picked up. The Applebee’s Pancake Breakfast is taking place on Sunday December 18th from 8:00-10:00. Tickets are $10 for this event. Please see a member of the board if you would like tickets for this event. Tickets will only be on sale until December 8th as we need to confirm numbers with the restaurant. If you would like to volunteer for this event please do so through the Fundraising Page. 2016 Annual Ice Show - Let Us Entertain You! Our annual ice show will be taking place on Sunday, November 20 from 1:00-3:00 p.m. at Iroquois Park in Whitby. Our five teams are excited to debut their new programs! We are thrilled to feature synchro teams from Newmarket, Leaside and Port Perry, as well as singles skaters from our surrounding clubs. ​Please contact icefyresecretary@outlook.com to secure your ticket. August 15, 2016 - Skaters from our Elementary and Pre Novice teams kicked off the 2016/2017 season with a full day camp in Oshawa, ON. 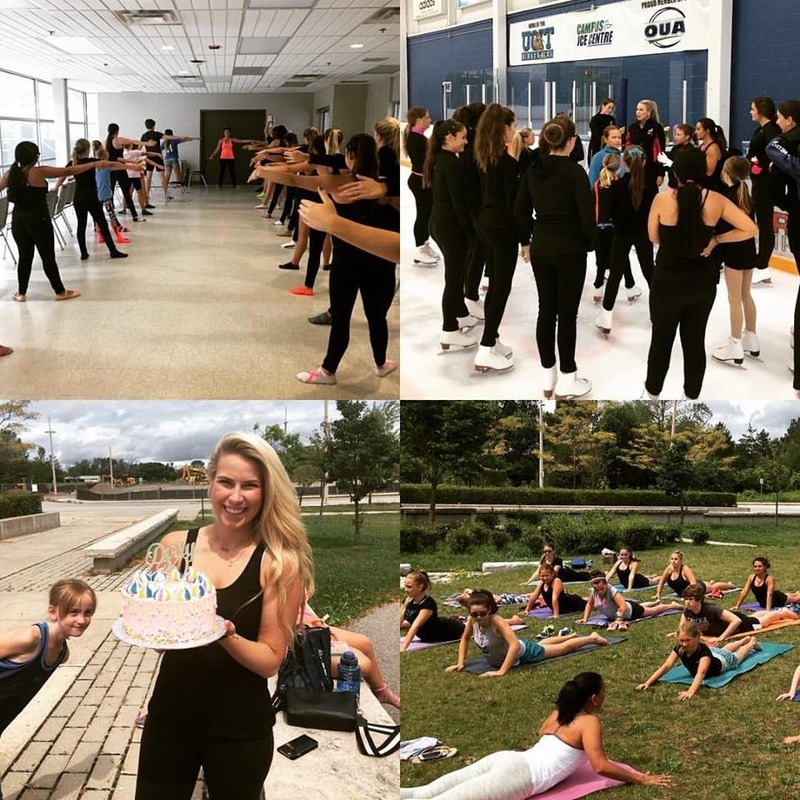 In addition to many hours on the ice, skaters participated in fitness class, yoga, and ballet! It was a great day of getting to know one another, bonding as a team, and getting back into shape for the season. Thank you to all of our instructors: Karlee Vukets (ballet), Narmin Nathoo (yoga), and Jackie Williams (fitness). Thank you to our on ice coaching and assisting: Mel, Kristen, Jackie, and Tanishah. Sunday practices will be begin next Sunday, August 21, for Elementary and Pre Novice, and regular practice will begin on September 8. ﻿​There are openings on our Beginner II Team! To learn more about the team visit their page here. ​There are openings on our Elementary Team!